After an intense but phantastic couple of game fair weeks we are back home again. 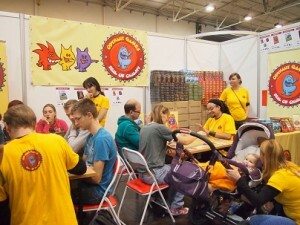 First we headed to Germany for the international launch of the Odynaut Games at Spiel ‘12 in Essen. Presenting the games to players and the press from all over the world was an unforgettable experience. Hardly recovered from this exciting journey we teamed up again with our demo crew for the next big challenge: Spellenspektakel 2012 in Eindhoven, the Netherlands. This game fair was quite a rollercoaster ride again. Fair visitors could show their appreciation for the games they played at the fair by voting. The Odynaut Games appeared to be in a winning mode. Chipleader turned out as the number 1 on this TOP 30 list!